Listening to Tony Abbott speak can be confusing. One day he’s saying something like “Let me be as categoric as I can, the GST won’t change, full stop, end of story“. Then, in the very first budget brought down by his government, the GST is immediately put under the spotlight – leading up to last week, where he praised the States for ‘considering’ an increase to GST, describing it as “one of the better [taxes]“. Abbott’s seemingly contradictory statements can leave the average punter scratching their head, wondering how to make sense of ‘Abbott-speak’. This is because Abbott is often speaking ‘Truthiness’ rather than English – particularly at press conferences and interviews. ‘Truthiness’ is an English dialect often used by politicians. It was identified by American Commentator Stephen Colbert to describe the particular subset of language used by US politicians. The key difference between ‘Truthiness’ and everyday English is that someone speaking Truthiness uses words and concepts that ‘feel’ true, or that they wish you to believe to be true, without worrying about whether or not they actually are true. The Truthiness dialect sounds very similar to normal everyday English, which is why it often causes confusion. So I’ve prepared this handy dictionary for you which translates some of the key Truthiness phrases often used by Tony Abbott. English: We can’t think of anything else to say about the budget that doesn’t sound REALLY bad…. There was a much used Truthiness phrase which preceded this one – that has passed out of common usage this year – “Debt and Deficit Emergency”. The English translation of that phrase is “We want you to think there’s a major economic problem, and that only we can fix it”. This wasn’t true of course – but Truthiness doesn’t have to be true, it just has to feel true. Of course since taking Government, the LNP have arguably turned our economy into a basket case, and created the world’s worst debt trajectory. This makes it challenging for them to continue to use the ‘Debt and Deficit emergency’ Truthiness phrase without having it potentially used against them. The LNP have now rolled back their ’emphatic’ commitment to deliver “a surplus in [their] first year in office and….achieve a surplus for every year of [their] first term” – which of course they haven’t. Instead they’ve gone for the only thing they can really say without admitting ‘we’ve done a really crap job’ – which is essentially that ‘we’re working on it’. The budget is effectively ‘in the shop’ for repairs. English: That topic might make me look bad, I’d rather talk about…. 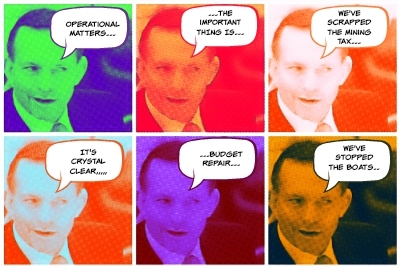 Tony Abbott uses the phrase “the important thing is….” a lot in interviews. Rather than indicating that a particular point is actually important – which would be the normal English interpretation of the phrase – when used in the Truthiness dialect, it seems to indicate that the question Abbott has just been asked is probably not one he wants to answer. So instead of responding to the question he has just been asked, he diverts the listeners’ focus onto a topic he does want to talk about – referred to as ‘the important thing’. Neil Mitchell: Theoretically, hypothetically, would you find it acceptable to pay people smugglers? Now play it back, and replace the phrase “no cuts/no change to [insert name of program] with “I REALLY want you to vote for me”. It makes a lot more sense that way, doesn’t it? Tony Abbott and his Ministers use this phrase regularly to respond to any questions on asylum seekers that they don’t wish to answer – which is pretty much any question on asylum seekers. 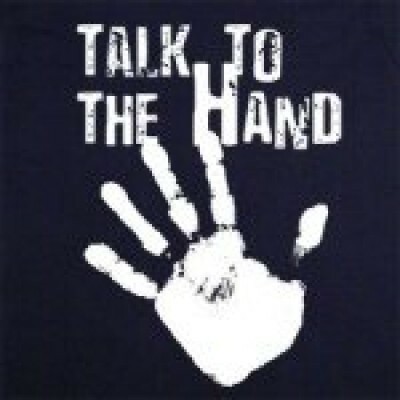 It’s the Truthiness version of “Talk to the Hand”. JOURNALIST: I can understand not providing operational details now, but surely just acknowledging ‘there’s been a boat, it’s been spotted, there are now operational approaches to deal with it and we will give those further details in due course’ – that’s not unreasonable surely? Yes you have Peter Dutton. Yes you have. 3. Look at how we are keeping you safe from this HUGE threat that is actually half way across the world and not really much of a threat at all. 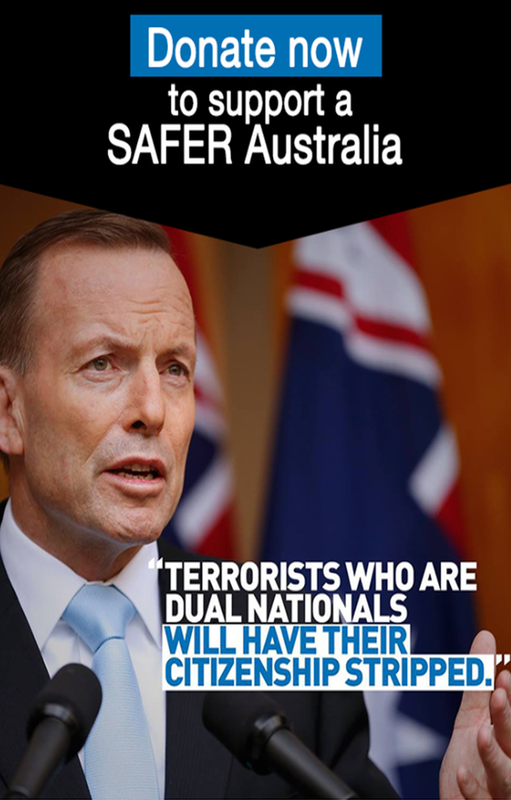 For more information on how this phrase is used, and the actual threat it poses to Aussies, see my Idiots Guide to avoiding Terrorists under the Bed. The problem with understanding the phrase “We’ve stopped the boat”, as I’ve said before, is that the phrase doesn’t specify what we’re supposed to have stopped the boats from doing. The boats haven’t stopped coming, although they have possibly slowed – it’s a little hard to tell definitively, due to the Government’s ‘Talk to the Hand’ approach on asylum seekers. We do know the Government hasn’t stopped the people smugglers and they haven’t stopped deaths at sea. They haven’t even completely stopped arrivals. But still Tony Abbott repeats the phrase “we’ve stopped the boats”. So what does this Truthiness phrase mean in English? The English translation of this oft-used phrase appears to be that Abbott and his Government have stopped talking about anything to do with the boats, by saying that anything relating to asylum seekers coming by boats is an ‘operational matter’ (see above). This has taken the political heat out of the problem, but left the problem of finding homes for asylum seekers like the Rohingya to our poorer neighbours. The above is just a brief selection of Truthiness phrases designed to help you get the hang of identifying and interpreting Abbott-speak. 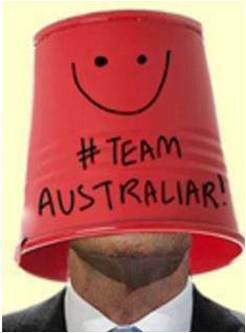 The key to translating Truthiness is to listen carefully to what Mr Abbott – and other politicians – say. Don’t necessarily take their words at face value. This is particularly true of three word slogans or where what is being said isn’t backed up by facts or logic. If you do this, you’ll be fluent in Truthiness in no time!